There are many types of motorcycles and most are optimized for a specific style of riding. But as far as I’m concerned, a street legal dirt bike is the galaxy-brain solution and so the 2019 Honda CRF450L, with its LED turn signals and big-displacement single-cylinder engine, is about to become the ultimate two-wheeler. And yet, the selection of street legal dirt bikes is relatively limited and most have small engines. Hence my excitement at Honda’s announcement. Honda has recently introduced a big revision to its entire CRF off-road motorcycle line which now features seven models. You can read about the whole family in the company’s press release but the machine that’s got my hair on fire this morning is the 445cc liquid-cooled 10º single-cylinder four-stroke CRF450L. The 50-state road legal bike is fuel injected, has dual fan-cooled radiators, a lithium-ion battery to save weight and a handsome facia with an LED headlight tucked into it. It’s much cooler looking than other dirt bikes that still opt for the square-cyclops look. 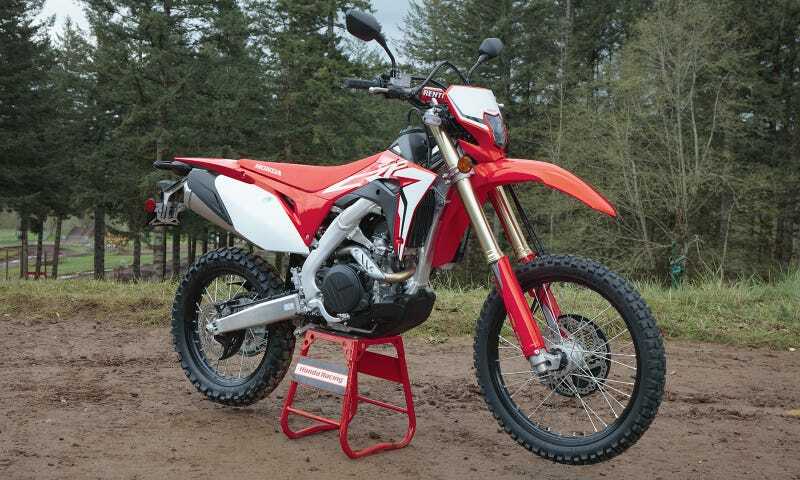 The CRF450L also has a skid plate and a titanium 2.01-gallon gas tank which should give the bike a significant range. This bike has a 58.9-inch wheel base, 12.4 inches of ground clearance and the seat is a tall 37.1 inches from the ground. It’s no “dual sport” that’s good for touring and light or careful adventure riding. The CRF450L looks like a dedicated dirt bike that happens to be able to wear a license plate just like my beloved Yamaha WR250R. Except the Honda only a few pounds heavier than my plucky Yammie, and has 200cc more displacement. That means a lot more power and theoretically a lot more speed. My 250 isn’t slow and can cruise north of 80 mph if the rider’s brave enough to handle heavy wind, but it keeps you very busy with shifting and loses trail holeshots to 450cc machines. This CRF450L should be able to send it over sand dunes a lot more easily than a 250, and the fact that it’s street legal makes it easier to justify owning. A license plate allows you to travel between trails on bigger rides, and also use the bike for buzzing around town. In case you haven’t gathered from the tone of this post, I happen to be a huge fan of plated dirt bikes even if you’re not heading off-road. My WR, which rides on custom gold valve Race-Tech suspension that’s been dialed in for me, is an absolute joy to rip down alleyways, off curbs and between lanes of cars on my way to the beach. If you live somewhere rural the setup is even better–you can just rip right to the trails from your driveway. I love the simplicity of a single-cylinder bike and the toughness of an off-road vehicle. Plus, the soft suspension is great for potholes and the upright riding position helps with comfort and visibility. Seats can be a little rough, but dirt bikes are meant to be ridden from a standing position half the time anyway. Basically, it looks like Honda’s bike will offer all that and a whole lot more power. Unfortunately it’s also a lot more expensive. A new 250cc plated dirt bike will set you back about $6,000 to $7,000 and I bought my lightly used ’08 for a little under $3,000 two years ago. Meanwhile, this new CRF450L lists at $10,399. But a dirt bike you can ride on the road is a beautiful thing. To me, it’s the ultimate form of what a motorcycle should be–a lean machine that can take you anywhere.